The following article comes courtesy of an email I received from an equities trader (daily timeframe) who was working to improve his pullback entries within a trending environment. His challenge was that while the market was maintaining a steady state trend with no real signs of weakness or topping action, how exactly should he be timing the entry? Attempts to get in on the first pullback entry were typically being run over as the pullbacks went on to produce a more complex (multiple-leg) pullback. So his question was, "How do you know if this pullback is a simple pullback or a complex pullback?" "So I know not to try and seek perfection but I seem to be having trouble in real time. Here is a chart. I was expecting Pullback trades and would have traded accordingly!!" 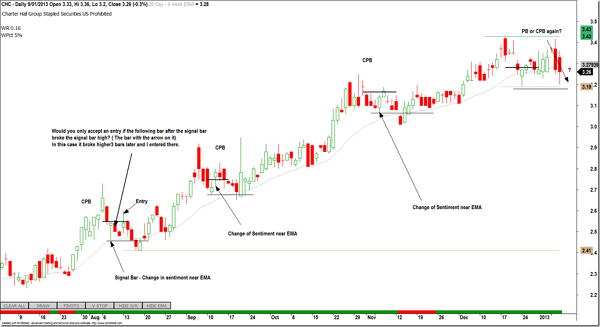 "On a chart like the one below would you wait a few more bars for a green bar for a signal bar? Many lows seem to come from a red bar with a tail like this near the EMA." One of the million dollar questions in trading is how do you distinguish a pullback from a reversal? If you could answer that you'd make millions. 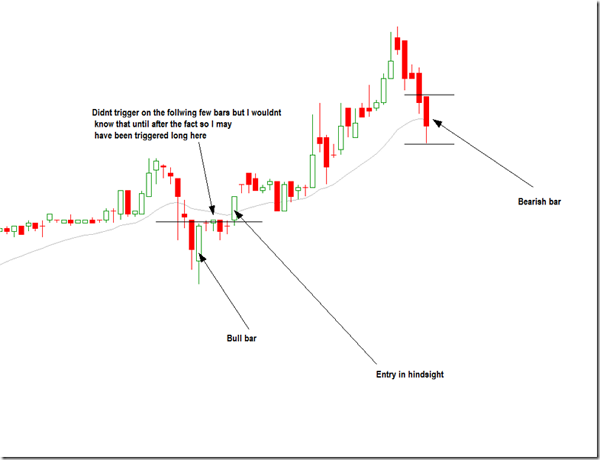 Closely related is, how do you distinguish a simple (single leg) pullback from a complex (multi-leg) pullback? You're right that we can't expect perfection! The reality is that we cannot know what the best entry strategy will be until we review the trade with the benefit of hindsight. All we can do is ensure that price is within an area in which we're happy to enter, and try to get the best price possible within that area. Then manage the trade. Our skill at read the shifting sentiment and making higher probability decisions will improve with experience. But we can never expect perfection. That being said, there are ways we can determine that the "better" option is waiting for the complex pullback and passing on any temptation to enter on the first signal. Have a look at the nature of the candles within these charts. There are very few periods of smoothly flowing "single-direction" price action; perhaps only half a dozen bars from around 25th July, and then again in late Aug and Oct. The vast majority, while clearly trending higher, are doing so in a quite choppy manner with much overlap between bars. All prior pullbacks were of a multi-leg variety. Given this context, and in the absence of any change in the nature of price movement, expect all future pullbacks to also require multiple legs. This is a simple case of matching future expectations to past evidence. When looking at a chart, if all prior setups required a complex pullback, and the nature of price movement has not changed for any reason, then anticipate all future pullbacks also requiring complex pullbacks. This is just the nature of current sentiment within that stock; with sufficient back and forward play from bulls and bears to result in choppy action. 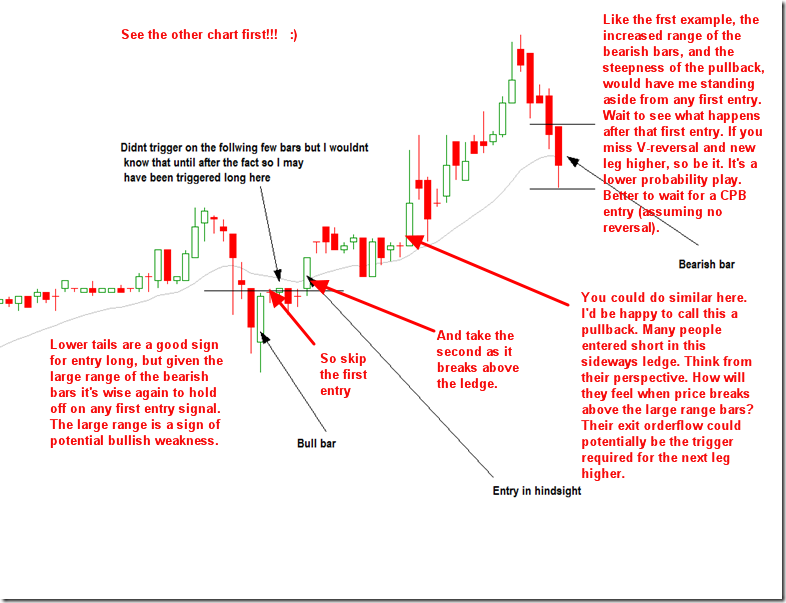 If you are waiting for a complex pullback and miss a simple pullback that actually did work… so be it. You missed one. Move on to the next. Better that than take many losses through lower probability pullback trades that were unsuited to the environment. So the simple response to the question…. 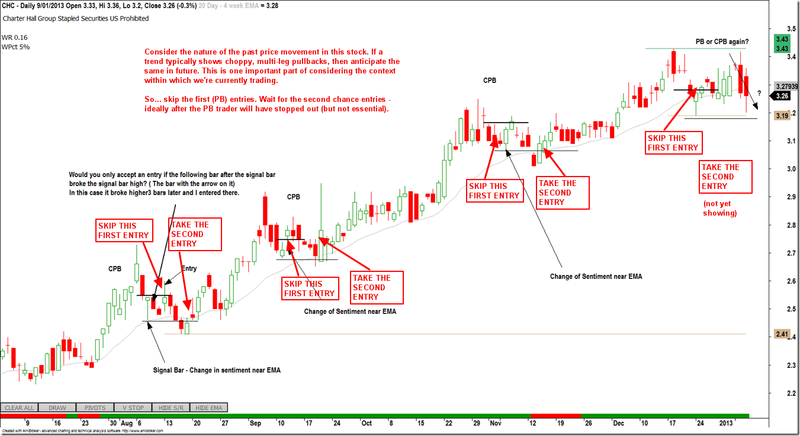 the nature of this stock is for pullbacks to extend for multiple legs… so wait for 2nd chance entries, not the first ones. See the images below for extra notes. Always consider the context within which you're trading. How has the stock behaved in the past, and is there any reason to expect different in future? Look to past price action for clues!